Finding the Mintage of various Coins at one place arranged by year has usually been a challenge. 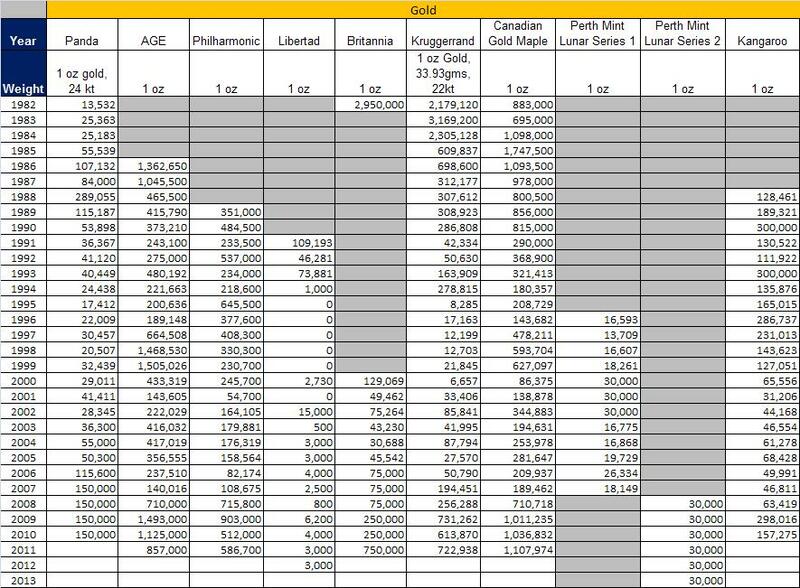 So here is a consolidated list for Silver coins arranged by year. The mintage starts from as early as 1981 and continues all the way to 2013. The coins covered in this list are Canadian Maple leaf, American Silver Eagles, Austrian Philharmonics, Mexican Libertads, Australian Kookaburra, Koala, Perth Mint Lunar Series 1 and 2, Krugerrand and Brittania’s. One of the key information I have tried to compile is the breakup of Old square capsules and New Remint Kookaburras. I believe this would be useful for all collectors. Hi, Would you mind sharing how you intend to use the raw data? Excellent work. I was trying to get the mintage details myself into a single spreadsheet and this is a big help. Would you also have the consolidated details of the proof mintages in the silver coins ? thanks.